The cardboard Halloween town is basically three milk boxes inside a diaper box. If I were to advertise it, it would sound something like this: 100% recycled toy for kids. I love simple toys, don’t you? On top of that, creating something that my kids enjoy playing with, makes me very happy and gives me confidence to keep on trying my hand at making kid toys out of cardboard boxes: a car wash, the Arc de Triomphe and now a Halloween town. Step 1. Cover the milk boxes with paint tape. Step 2. Paint the boxes in white. Step 3. Cut out windows and doors. Outline them with the marker. Step 4. Cut out one side of the diaper box and paint the inside using black paint. During the day kids can use small toys (like the Lego people) to play with the houses and when the night comes and it gets dark, you can turn off the light and place tealight candles inside the houses. 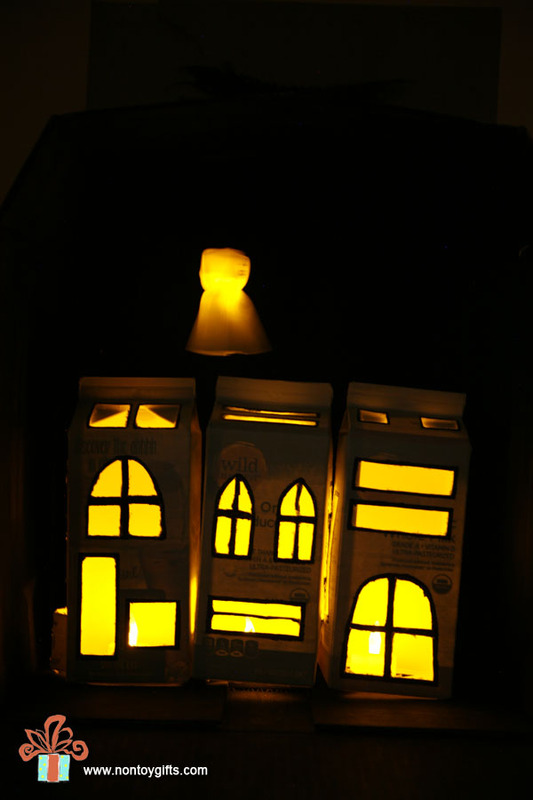 Battery tealights are a lot of fun on their own (my kids like to pretend they are the candles on their birthday cake and try to blow them out or they build tents and hide inside with their candles) but paired with these milk box houses, they become truly magical. 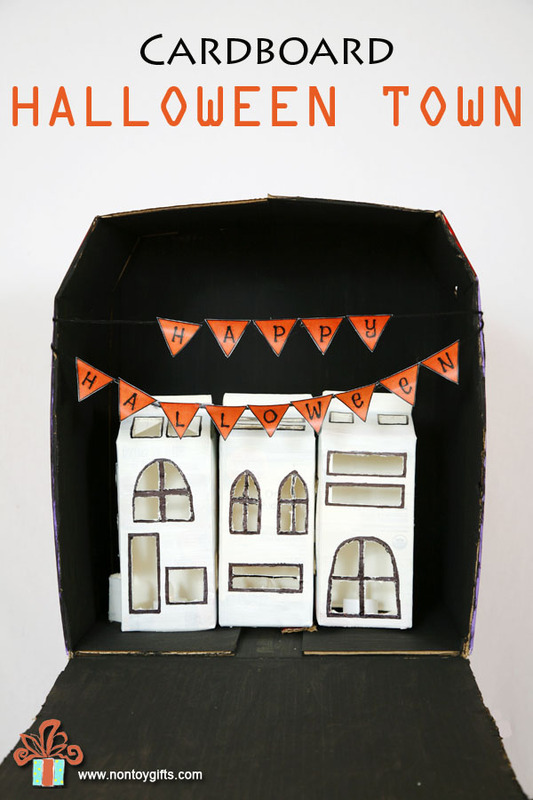 Have fun playing with your cardboard Halloween town! 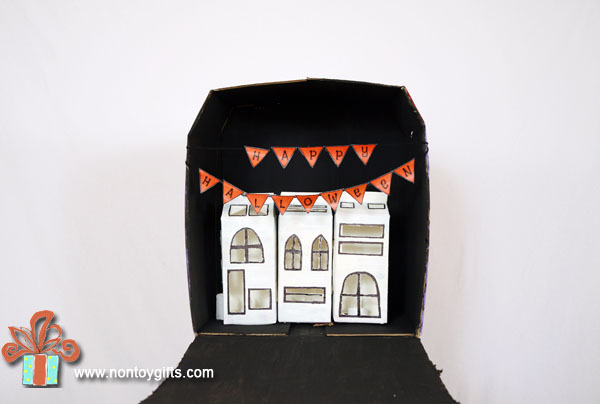 For more Halloween ideas (like 25 Non-candy Halloween Treats) click here or visit my DIY cardboard toys if you love turning cardboard boxes into toys as much as I do. What a fantastic way to recycle milk cartons. I wish you could send some my way because I’m am having the hardest time finding enough milk cartons! I may have to wait until NEXT winter for my project. lol. Thank you for sharing with us on Welcome Home Wednesday. We hope to see you next week! Oh my gosh! This is so cute!! I’m pinning this:) Definitely going to make one with my kids, thanks for sharing! So glad you like it, Randi! I’m sure your kids will have lots of fun playing with their Halloween town. Oh I love this idea, it looks so good lit up. This is so cool! It’s so creative and I think I’m going to have to try making it for Halloween. Thanks so much for sharing this idea at Share The Wealth Sunday! SO glad you like it Lisa. It’s rather easy to make and fun to play with. What a brilliant idea. Never thought of using milk bottles. It looks so effective! Wow, how beautiful this looks when it’s lit up! Fun idea – I love the recycled cardboard!